Call to Artists: 8 artists or teams will be chosen to participate and will receive a $50 Blick gift card toward supplies. Winner will receive an additional $200 Blick gift card. 4×6’ canvas provided by Blick. Participants use their own paint supply. 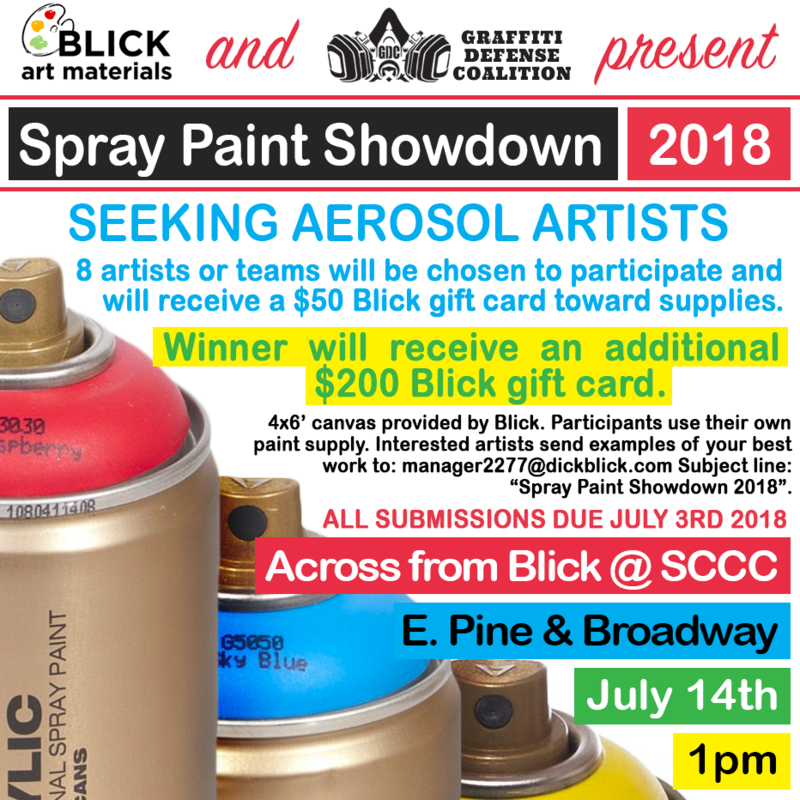 Interested artists send examples of your best work to: manager2277@dickblick.com Subject line: “Spray Paint Showdown 2018”. Location: Across from Blick @ SCCC Courtyard park. 5 solo artists or teams will be chosen to participate and will receive a $50 Blick gift card. The winning solo artist or team of the showdown will receive an additional $100 Blick gift card. 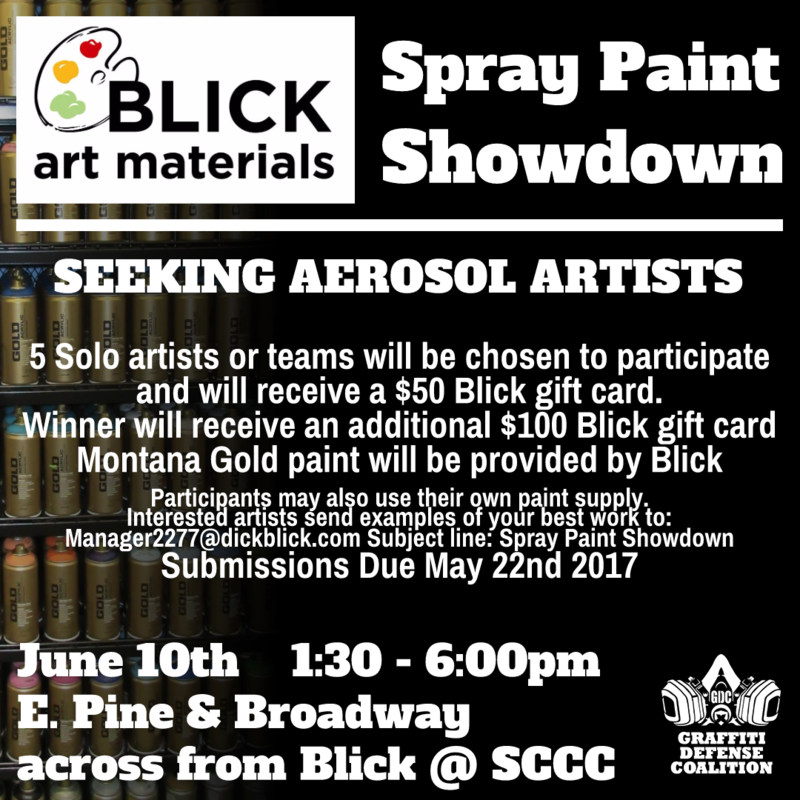 Montana Gold paint palette will be provided to participants courtesy of Blick and Montana Gold Spraypaint. Participants may also use their own paint supply. 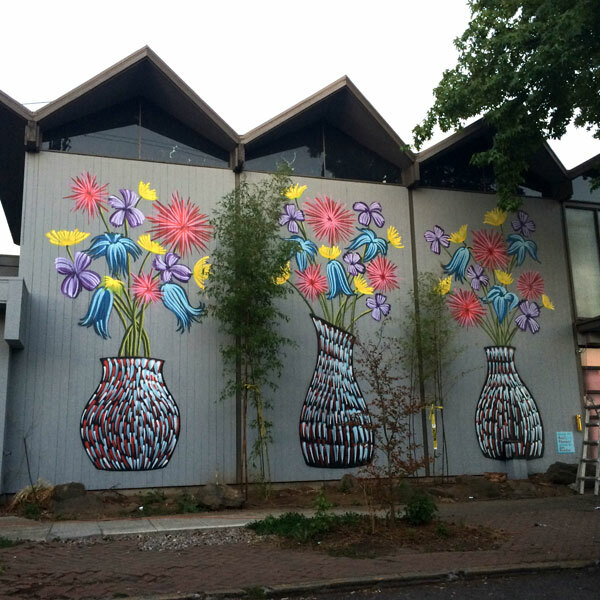 What’s new in the Seattle mural scene? While Seattle Mural Project is currently not developing any mural projects at this time, we are very excited about some projects being organized by some of our friends in the mural department. Probably the biggest news in Seattle murals right now is the huge project SODO Track being undertaken by Seattle’s 4culture and Urban Artworks. With over 50 artists, 32 buildings, stretching two miles and spanning the course of 3 years, SODO Track is a behemoth endeavor to say the least. Both 4culture and Urban Artworks have a long standing history of organizing great art. Recently Paul Allen has stepped in to help support the project contributing a very generous $50,000! This is sure to bring amazing and long lasting works to Seattle. Follow the SODO Track instagram page! 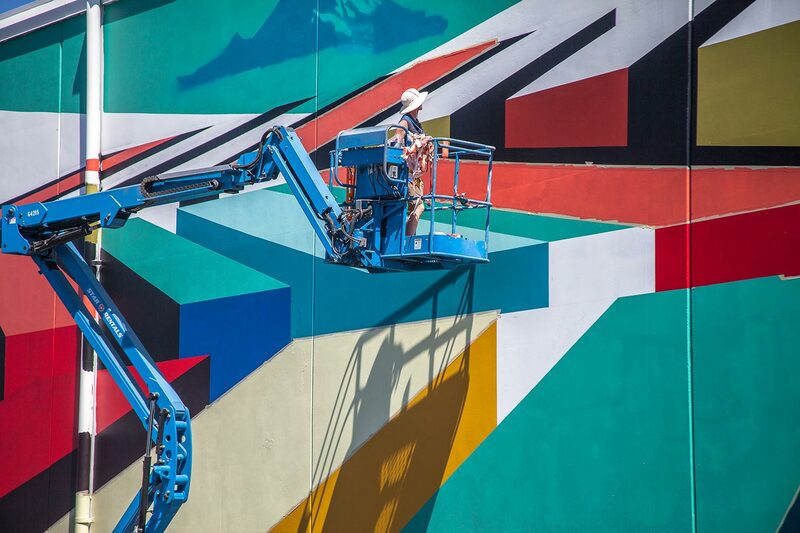 Another project that we’re totally excited about is artSEA, the new mural initiative organized by The World is Fun (TWIF). With an impressive roster of twelve international and local artists and growing, we’re super excited to see what they have in store for the summer of 2017. 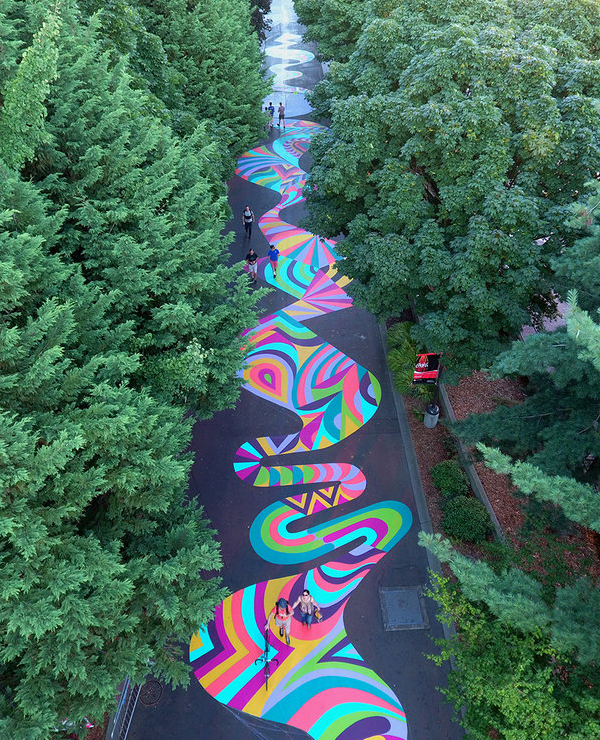 This summer they completed two impressive projects starting in July with a humongous 350 foot walkway project at Seattle Center by Baltimore duo Jessie Unterhalter and Katey Truhn. 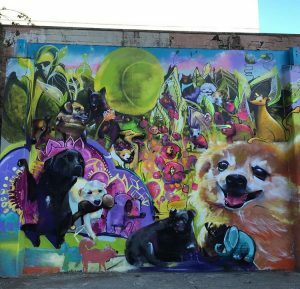 In August artSEA invited New York based artist Cern to breathe some life into a well deserving wall at Seattle’s Regrade Park in the densely populated Belltown neighborhood. 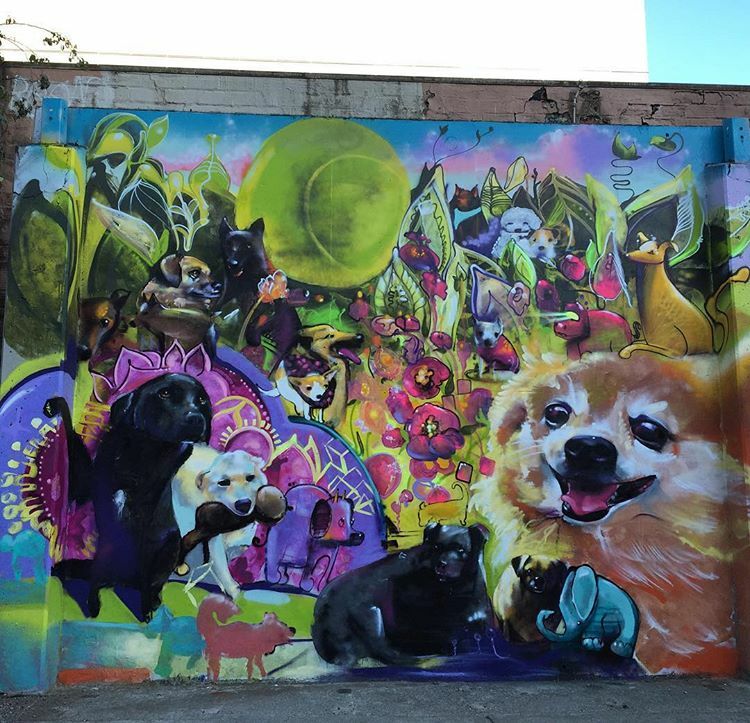 Working with the Downtown Seattle Association and Seattle Parks and Recreation, Cern and artSEA envisioned this vibrant canine themed mural perfectly situated in the dog off-leash area at Regrade Park. This welcome addition of color is appreciated by local residents, park patrons and dog owners as it helps to bring a needed contemporary aesthetic to the once relinquished park. Awesome work thanks to Cern and the artSEA team. Some great artists are involved with artSEA such as Seattle favorites They Drift and once Seattle resident Karl Addison who now lives and works out of Berlin Germany. Addison has already created a very cool mural at the TWIF offices which can be seen on the artSEA website. We hope Addison comes back to do some more awesome murals for the artSEA project in Seattle. You can follow the artSEA instagram page for great pics of the project. With many more artists committed to the artSEA project we cant wait to see what great upcoming murals they organize. Exciting times for Seattle murals! We’ve had the opportunity to work with both Urban Artworks, and The World is Fun and have seen 4culture support some amazing art initiatives. They are all great groups that have brought amazing art and events to the Seattle area. We’re so happy to see these groups working on great mural initiatives and cant wait to see more! If you are an artist or a property owner and want to get involved with either of these projects head over to their respective websites for contact information. artSEA and SODO Track. The mural at the Hotel Sorrento parking garage is moving right along! Scaffolding is in place and Spokane based artist Ellen Picken is well underway. http://ellenpicken.com/ More updates to come! More info about the project here! Thank you to Anirudh Koul for the use of his image which has been modified. We’re holding a public meeting Sunday April 12th 2015 at Sorrento Hotel which is open to all community members who RSVP. This meeting is for the community to provide feedback on the selected finalist artists for the Sorrento Hotel parking garage mural project. Please RSVP in email no later than April 11th. Reminder about public comment 3-25-15 at Sorrento Garage. Just a reminder about tomorrow’s onsite public comment opportunity. Representatives will be onsite at the southwest garage entrance to answer questions on Wednesday March 25th from 11am until 2pm. We will be taking input from community members, residents, and anyone interested in providing their input. The southwest garage entrance is located at the corner of 9th Ave. and Madison St. 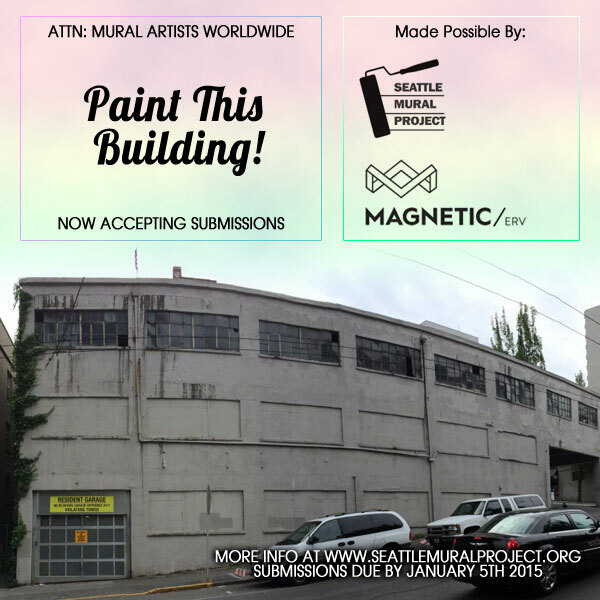 The Seattle Mural Project, Magnetic ERV, and the Department of Neighborhood’s Matching Fund are seeking neighborhood feedback related to artists who have submitted their qualifications to paint a mural on the Sorrento Hotel garage at 932 Madison Street on the northeast corner of 9th Avenue and Madison Street on First Hill in Seattle, Washington. This public comment and input phase will end on April 5th, 2015. 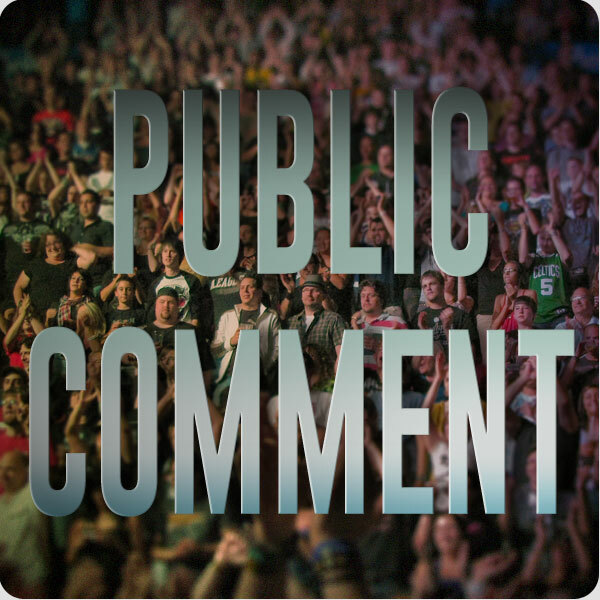 GO HERE to submit your comments and feedback. This summer Seattle Mural Project will make its mark on the historic Sorrento Hotel parking garage in Seattle’s First Hill neighborhood. 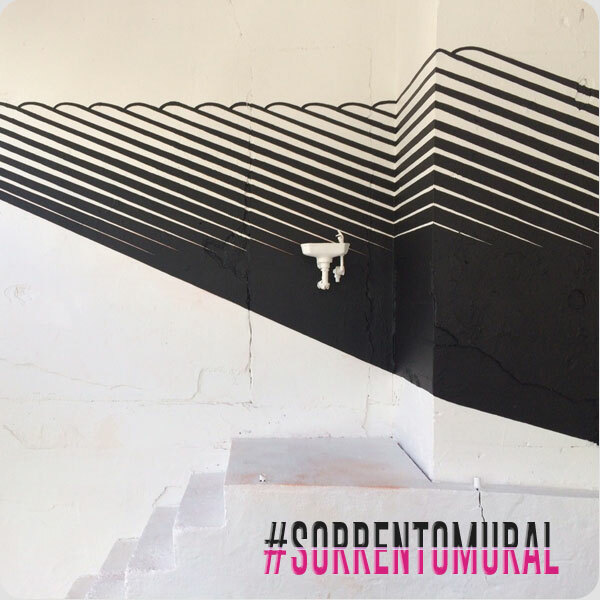 Now accepting submissions from mural artists and designers. Click here to visit our page with all the information and details you will need to submit! Nosego in Seattle from Seattle Mural Project on Vimeo. This amazing creature “Suki” by the talented Nosego landmarks his work in Seattle and puts a gem on the map for all to enjoy. Thanks to ARTPRIMO and Miller Paint for the generous support. Seattle Mural Project in partnership with the Department of Neighborhoods and Urban Artworks present a mural by Baso Fibonacci and Zach Rockstad on FRED Wildlife Refuge in Capitol Hill. Special Thanks to ART PRIMO, Miller Paint, FRED Wildlife Refuge, All the contributors to our Indiegogo campaign and Everyone who has volunteered their time to make this possible.